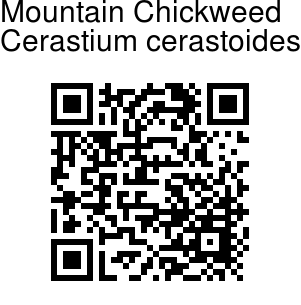 Mountain Chickweed is a small perennial herb, only 10-20 cm tall. Stems are creeping in th lower part, rising up in the upper part, branched distally, velvety. Leaves are linear-lanceshaped, 8-20 cm long, 1.5-2 mm wide, with a long-pointed tip. Flowers are white, 1-1.5 cm across, borne in 3-7-flowered cymes, rarely singly. Bracts are leaflike, lanceshaped. Flower stalks are 1.5-2 cm long, glandular velvety, recurved in fruit. Sepals are broadly lanceshaped, 4-6 mm, margin membranous. Petals are obovate, 8-12 mm, 2-lobed for about 1/4 of their length. Stamens are 10, styles 3. Capsule is cylindric, 1-1.2 cm, 6-toothed. 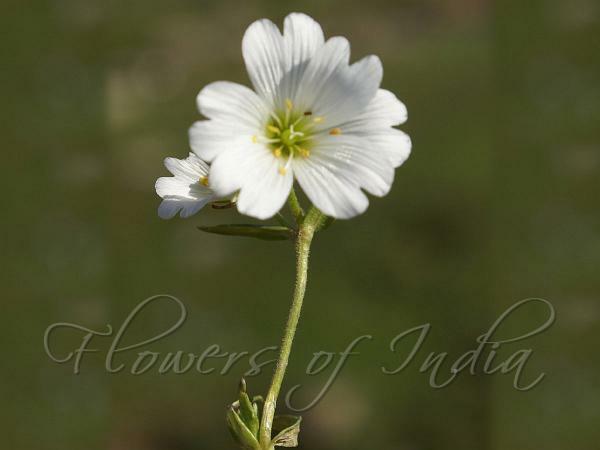 Mountain Chickweed is found in the Himalayas, from Pakistan to Himachal Pradesh, at altitudes of 3000-4800 m. Flowering: May-August. Photographed in Khillenmarg, Kashmir & Lahaul, HP.